The quarter-century from the American Revolution to 1800 was an extraordinary political era. The immediate task of defining the newly independent United States of America called for the creative energies of the nation. The best talents produced remarkable intellectual activity in reasoning out solutions and helping to give them effect. Alexander Hamilton was one of the most influential men of this time. He and the other "Founding Fathers" created a representative government based on the principle of popular rule and a market economy fueled by the energies of individual citizens. These have become the commonly accepted elements for national success. As the oldest enduring republic in world history, the United States government has stood the test of time. Hamilton was a prolific, persuasive writer, explaining to his fellow citizens what he thought was right for America and why. His moral, political and economic principles became integrated into the great documents that established the new nation. He made the strongest case in support of the Constitution, an important foundation of our federal government ensuring the inherent rights of men. Long after he was dead, many of his arguments were included in the opinions of the influential Chief Justice of the Supreme Court, John Marshall. Hamilton's transformation of America's finances and economy in its first years of independence was extremely successful. As the nation's first Secretary of the Treasury, he put into effect an interlocking system of law, finance and incentives that put the new nation on firm financial footing. By setting the public finances in order, the federal government was strengthened. This promoted national prosperity and a stimulation of economic development in the country. It enabled a new way of life for America's citizens. Hamilton’s mission was to widen man’s possibilities, to work for oneself through the marketplace. Each individual could prosper if he proved energetic and hard working. He gave Americans a chance to become self-made, just as he himself became. Hamilton was born in 1757 out of wedlock in the sugar islands of the West Indies (the Caribbean) on the British island of Nevis, where the slaves outnumbered their white masters twenty to one. His father, James Hamilton, the son of a Scottish laird had come to the West Indies to make his fortune as a merchant. However, James abandoned his family when Alexander was about 8 or 9 years old. Then tragically, Hamilton's mother, Rachel Faucett Lavien, died of fever when he was about 12 or 13 years old. Hamilton's guardian, the merchant Nicholas Cruger, employed Hamilton in his trading business in which he exchanged the island's sugar for staples that were not produced locally. Cruger recognized young Hamilton's exceptional business abilities and sent him to America in 1772 to continue his education in finance. When refused permission at the College of New Jersey at Princeton to accelerate his program of studies, he enrolled instead at King's College (now Columbia University). When he was not yet 20, he joined in the growing dispute between the American colonies and the British government. He then enlisted in the militia where he fought in the battles around New York City in 1775 and 1776. His zeal and organizing ability brought him to George Washington's attention and led to a commission as lieutenant colonel in the Continental Army. He became aide-de-camp to General Washington for four years. During his service, Hamilton became aware of the need for a stronger central government. State legislatures held the real power in the country at that time and getting money from the states to keep the army together proved very difficult. In his later career, this concern became an important component of his policies. In December 1780, Hamilton married Elizabeth Schuyler, the daughter of a wealthy and influential upstate New York land owner, Philip Schuyler. This connection placed Hamilton in the center of New York society. Seeking to be reassigned to field command in the war, Hamilton was given an infantry brigade by Washington. He led an important night assault and capture of the British Reboubt #10 during the siege of Yorktown. On October 19, 1781, the British surrendered and the independence of a new nation was secured. Hamilton's early life in the West Indies was surrounded by extremes of great wealth and hardscrabble struggle in islands full of slaves and wealthy masters, merchants and lawyers. He was employed by St. Croix’s most important exporter of sugar and molasses to the American mainland and importer of food and clothing for the thousands of people who worked the plantations. Remembering these early conflicts in his life – affection and abandonment, beauty and brutality, refinement and savagery - Hamilton vigorously opposed slavery as an adult. The America that Hamilton came to was a land of farms, many of them worked by slaves. Hamilton had a different vision. He foresaw a diverse economy, offering opportunity for the full variety of human talents. He believed strongly in the virtue of hard work and the ability to rise through education, rejecting the notion that persons of noble birth were predestined for salvation. He respected the abilities of blacks and worked to end slavery. In the former state, a man is governed by the laws to which he has given consent, either in person or by his representative: in the latter, he is governed by the will of another. In the one case, his life and property are his own; in the other, they depend upon the pleasure of a master….. The foundation of the English constitution rests upon this principle, that no laws have any validity or binding force without the consent and approbation of the people, given in the persons of their representatives, periodically elected by themselves. South Carolina ignored Hamilton’s proposal and when Charleston and the rest of the state fell to the British, the British did what Hamilton predicted, offering freedom to slaves in exchange for military service. Thousands accepted, and left with the British as war’s end, settling in the Caribbean as free men. Hamilton also produced a practical plan for the government of Toussaint L'Ouverture in Haiti and encouraged the successful slave revolt there against the French. When he advised President Washington not to return men that had been liberated by the British during the war back to slavery, he said "The abandonment of Negroes …. to fall again under the yoke of their masters, and into slavery, is as odious and immoral a thing as can be conceived." After the war, Hamilton was a prime mover in the early abolitionist movement in New York City. In 1785, Hamilton and 31 other prominent New Yorkers founded the New York Society for Promoting the Manumission of Slaves, dedicated to ending slavery. The society encouraged slave owners to grant their slaves freedom. He pressured the state legislature and helped to raise money to buy and free slaves. They adopted this credo: “Those, among us, who are held as slaves, are by nature, as much entitled as ourselves” to liberty. The Manumission Society encountered fierce opposition, especially from assemblymen of agricultural counties whose predominantly Dutch constituents still depended on slave labor. However, the society was successful in pressing the state legislature to enact the following: a voluntary emancipation law that allowed masters to free slaves between ages of 21 and 50 without obligation for their subsequent care, a ban on further sales of slaves to other states, a prohibition on the importation of slaves into New York, and a bill that freed all slaves from confiscated Tory estates that still remained state property. Hamilton himself never owned a slave, but he could never convince his wife to free her one slave, her body servant. Excerpts from “Alexander Hamilton, A Life” by Willard Sterne Randall, 2003, Harper Collins Publishers, New York, NY. American politics grew out of English ideas, institutions and customs. "Liberty under law" expressed in English common law was central to the colonists. However, men of varied nationalities and social origins came to a vast, wild, and isolated country and needed a fuller expression of liberty and equality in politics and society. The colonists were influenced by the rise of "Enlightenment" thought. According to this ideology, once the processes of nature had been started by God, He no longer interfered but let these natural processes follow the laws He had given them. These laws were the natural laws that men of the Enlightenment dreamed of discovering through reason and experiment. And, understanding these natural laws would lead to the improvement of the human condition. They recognized the importance of ideas such as equal natural rights to life, liberty and property and of limited government based on the consent of the governed, not government as master of society. This translated into the toleration of dissenting religious sects and the insistence upon taxation only by consent of a representative legislature. Americans overwhelmingly committed themselves to a republican system of government, in which liberty and justice were better served by passing popular choice through filters of representation. It was agreed that the source of political authority was the consent of the people and the end was the safety and happiness of the people, to be realized by securing their inherent rights to life, liberty and property. However, hard fights were fought over the issues of centralized or decentralized power and of agrarian or commercial-industrial predominance. Extreme loyalty to the states came naturally for some men who had long thought of themselves as Virginians, Yorkers, Yankees and the like. They wanted the strength of a union, as in a confederation of states, without the risk of raising a new oppressive power that would be equal to the English monarchy they had just fought for independence. There arose a heated and bitter controversy over ratification of the Constitution of the United States, especially in the state of New York. The Constitution, as written, would create a consolidated federal government with powers sufficient to coerce obedience to national laws. Hamilton believed these laws were necessary to govern such a large and promising national enterprise. Hamilton was elected a member of the Continental Congress in 1782 from New York and became a leading proponent of a strong national government. 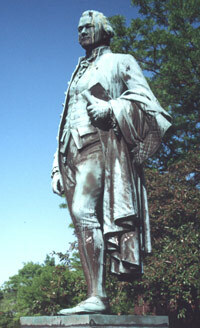 He, along with James Madison and John Jay, wrote a series of newspaper essays explaining and justifying the specific provisions of the Constitution. The Federalist, as these essays were called, appeared two to four times a week in the New York newspapers. Hamilton wrote the first piece in October 1787 on a sloop returning from Albany down the Hudson River. When the series was finished in May 1788, it had grown from Hamilton's planned series of 25 papers to 85. Jay fell ill early on, and wrote only a few pieces. Madison wrote over twenty; Hamilton over fifty, or two-thirds of the total. At the Poughkeepsie convention for ratifying the Constitution, Hamilton's speeches convinced the anti-federal delegates to change their votes to ratification. The Constitution proved a tough and flexible instrument, which could be adapted to political changes in the face of changing times. It created a national government with direct authority over vital concerns to citizens such as life, liberty, and property as well as the authority "to form a more perfect union, establish justice, insure domestic tranquility, provide for the common defense, promote the general welfare, and secure the blessings of liberty to ourselves and our prosperity." Other powers not assigned remained with the states. Government was divided into executive, legislative and judicial branches, creating a complex system of checks and balances. Today, The Federalist has permanent value as the fundamental commentary on the meaning of the Constitution. The efforts for ratification of the Constitution is one of the greatest events in the history of the United States because the relatively small number of great political talents who all knew each other held together the American republic throughout the volatile and vulnerable early years of the nation. See PBS's The American Experience, "Hamilton and the U.S. Constitution"